In a column titled, “Tim White: Time to kick government out of the booze business,” White wrote, “Remind me again, please: Why is it that North Carolina needs to regulate when a restaurant can serve a drink?” He was referring to SB155: legislation passed by the North Carolina General Assembly and signed by Governor Roy Cooper. A key component of the legislation allows cities and counties to adopt ordinances that permit restaurants to sell alcoholic beverages starting at 10:00 a.m. on Sundays. The previous start time was noon, in consideration of the normal church worship hour. And while we’re at it, can someone give me a really rational explanation why we’re getting so worked up over legislation that would let restaurant brunch customers order Bloody Marys before noon on Sunday? Does anyone really think that an 11 a.m. mimosa will be the deciding factor for anyone pondering the church-or-brunch conundrum? My response to Tim White and the multitude of others who support this legislation has nothing to do with worship attendance. I oppose the legislation because of the messaging. In a country founded on Judeo-Christian values and ushered into greatness because many people embraced those values, the messaging of this legislation belittles those values. Dr. Richard Lee lists some of these Judeo-Christian values in an article titled, “Seven Principles of the Judeo-Christian Ethic.” Here are six of the listed values which are rather self-explanatory: 1) The Dignity of Human Life; 2) The Traditional Family; 3) A National Work Ethic; 4) The Right to a God-Centered Education; 5) Common Decency; 6) Our Personal Accountability to God. Every indication is that, across several centuries in the history of America, leaders understood the tremendous benefit to society of messaging that held these values as deserving respect and attention. I contend the messaging was, in part, by way of encouraging respect for Sunday as a primary day of worship. I remember, in my youth, that most businesses were closed on Sunday. Blue laws have been part of U.S. Legal History since the colonial period. These laws, which today are usually referred to as Sunday closing laws, prohibit certain types of commercial activity on Sundays. Originally these laws were directed at personal activities regarded as moral offenses, such as gambling or the consumption of alcohol. In the nineteenth century, however, state and local governments passed laws that forbade businesses from operating on Sunday. Although these laws were clearly based on Christian beliefs, the U.S. Supreme Court has ruled that they do not violate the First Amendment’s Establishment Clause. Many blue laws have been repealed since the 1960s, but some laws that ban the sale of alcohol on Sunday remain in force. Consider those Judeo-Christian values provided by Dr. Richard Lee referenced above. I find it very difficult to understand how anyone would fail to see the tremendous positive impact on society if respect for these values is encouraged. I am old enough to remember when respect for Judeo-Christian values was encouraged. In spite of all the societal challenges of that time, I remember a country that was far more moral, civil, patriotic, family-oriented…simply a much better place. Among the reasons was the messaging of those blue laws. We have come to a time when the prevailing thinking is that Judeo-Christian values are to be relegated to a period in the far-flung past. Consequently, these values have been shelved by far too many individuals and groups who control the messaging in our country. My father talked about how there are many voices that cry out to us regarding what is acceptable behavior, reasonable thought. My observation is that the voices that oppose promotion of Judeo-Christian values are so strong, so powerful, that they are drowning out the voices that support these values and call the world to them. I contend that one who chooses any of the challenging issues of our world will, upon honest examination, find that embracing Judeo-Christian values is our best hope for rectifying those destructive conditions. Choose one…poverty, crime, racial tension, war, homelessness, and on the list goes. In Nathaniel Hawthorne’s day, as in ours, it was said that problems were so daunting that old principles must yield to new realities. 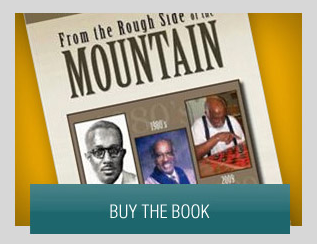 Perhaps, however, unfortunate new realities are the result of the disregard of old principles. Hawthorne recommended consulting ‘respectable old blockheads’ who had ‘a death-grip on one or two ideas which had not come into vogue since yesterday morning.’ Ideas like getting an education, a job and a spouse before begetting children. The words and actions of those in authority influence the thinking of the masses as to what behavior is acceptable. In pursuit of power, people in positions of authority are also influenced by the desires of the masses. In this circumstance, messaging flows both ways. Couple this two-way messaging with Judeo-Christian values being shelved and replaced by “feels good values.” The result is what George Will and Nathaniel Hawthorne warned against. We are on the precipice of totally turning from the values that helped make America an amazing country. Our rapid movement is toward being a nation with no moral compass. My problem is that the message from many in authority, and many under that authority who support the Brunch Bill, is that replacing Judeo-Christian values with “feels good values” is acceptable. No matter the destructive consequences to society, this shift is viewed as and messaged as acceptable. I spend a good bit of time in the Fayetteville Community Garden. On a recent visit, a young lady who has a garden plot told me someone stole three of her watermelons. She also showed me a sign she had put in the plot. It read, “Is that the way you want to be when Jesus comes back?” After hearing her account and thinking about the possible effectiveness of the sign, I concluded it will not likely be a deterrent when the melons next to it are large enough for eating. 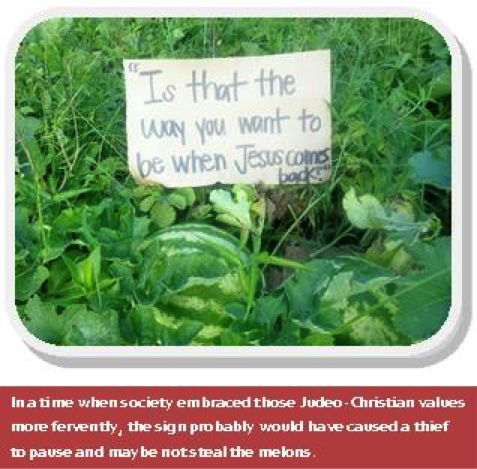 In a time when society embraced those Judeo-Christian values more fervently, the sign probably would have caused a thief to pause and maybe not steal the melons. Today’s messaging says those values belong in the past, leave them there. I contend that messaging is extracting a high cost from America and the cost is rising. The Brunch Bill is part of this messaging.